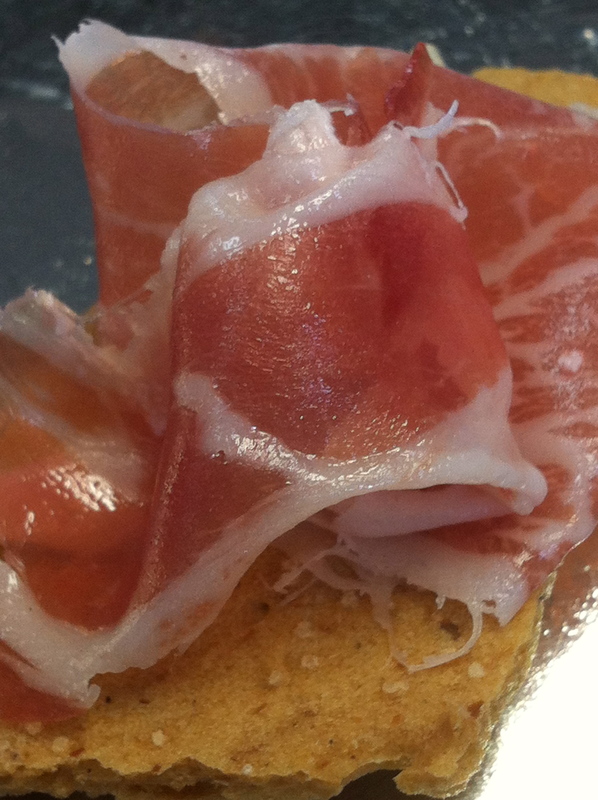 Ibérico de Bellota ham, atop gluten-free cracker bread I brought in from Dempsey Bakery. This time of year, an exorbitant amount of my posts revolve around the fall food shows: Wildwood, Arkansas Hospitality, North Little Rock Taste of the Town. While I haven’t even had time to write the latter of these, I was invited to an impromptu food blogger gathering today that had to trump that writing. The kind many of us have lusted over in the glowing digital pages of Gilt Taste or some such. Who even knew that Hillcrest Artisan Meats carried Jamón Ibérico de Bellota, one of the finest, rarest delicacies of the cured meat world? Apparently, Michael Roberts of Arkansas Foodies / Eat Arkansas did, and he invited several of us who happened upon the Twitter conversation to join him today for a tasting. This stuff was indeed pricey, at $89 / lb. We split it up five ways, though, and a half-pound was plenty to sufficiently experience the awesomeness. Just under $10 each wasn’t too bad, all considering. The Ibérico hogs are a particular breed of black pig, found only in Spain. And, apparently, there is Ibérico ham (a lesser grade), and there’s Ibérico de Bellota, which is allowed to run free in Spain’s oak forests and feast on acorns in the last period of its life. This exercise and diet gives the meat its unique flavor and complexity. Brandon Brown, proprietor of Hillcrest Artisan Meats (the locale often simply known as HAM), carefully sliced the precious product onto a tray for our group. We settled into the back room to survey our treasure. We all just stared at it and took photos for a little while. Finally, we jumped in. 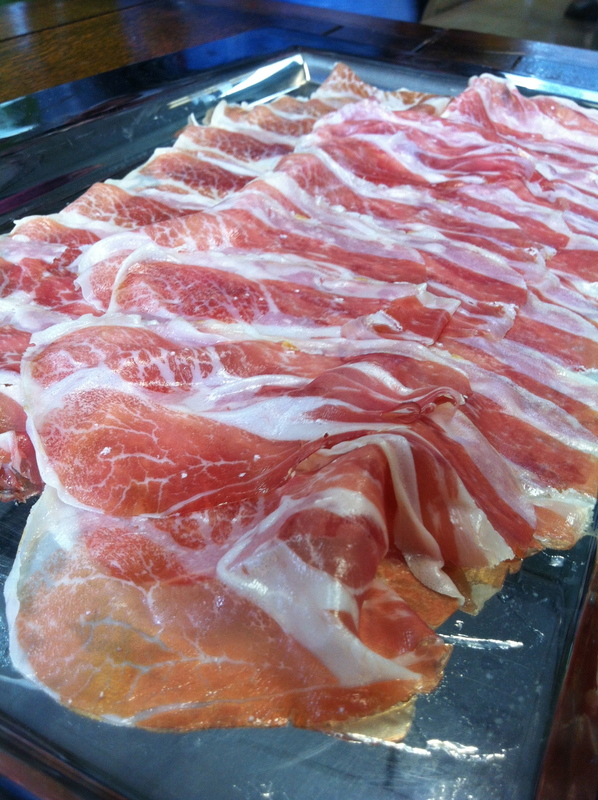 Our trayful of Ibérico de Bellota ham, lovingly sliced by HAM’s Brandon. There may have even been a few more inappropriate comments. It was sultry and decadent, yet light at the same time. It wasn’t as salty as you might think, considering it was cured for some time in sea salt. In fact, Brandon sprinkled it with coarse salt before serving the tray to us. It was just the right touch. And yes, even without ever having tasted an acorn, I would venture that Ibérico de Bellota ham tastes like one. The deep smell of fall embedded each bite and even lingered on my skin for hours after. Brandon brought us a small portion of American-raised proscuitto, for comparison. It was delicious, a little richer, but lacking the depth and delicacy of the Ibérico. This is one of those times you can really taste the extra money spent. 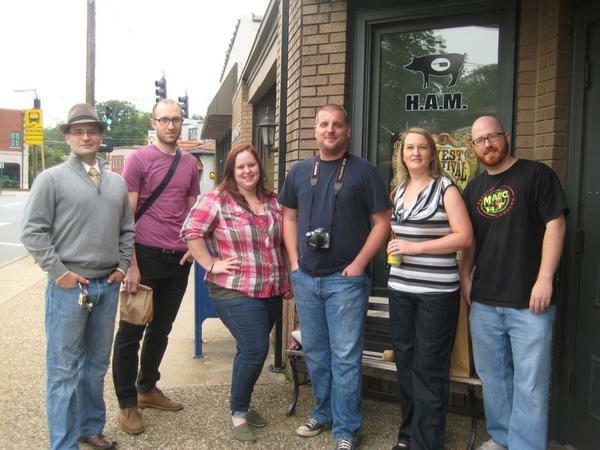 While the jamon was amazing, there are two real stories here: first, an ambitious local meat and sandwich shop bringing the world to Arkansas, and second, a growing, thriving group of local food writers who got to experience it. I’m thankful to have experienced both. Joel DiPippa, Daniel Walker, Jess Miller, Michael Roberts, me, Kevin Shalin. Photo by Sara Shalin. And we’re not an exclusive group, y’all! We just happened to be on Twitter at the same time and coordinated. Are you a blogger and want to join us for our next food outing? Make sure you’re a member of Arkansas Food Bloggers Network on Facebook and we’ll be more organized about it next time. I’m pretty sure it will include a play date with sous vide machines. Great write-up, Christie. I'm so glad you came yesterday! Sara and I just had the best time reading and watching your link. Loved it! See ya soon. Awwww! I'm honored. Blushing, even. Glad to meet you today.